A review of an authoritative book on the 27th Sophia Gray Memorial Lecture, and a call for a fuller record of the occasion and its surrounding events. The Sophia Gray Memorial Lecture, conceptualised by this publication’s editor, Paul Kotze, and hosted annually through the offices of the Vice Chancellor of the University of the Free State (UFS), is an important occasion for the gathering of South Africa’s architectural collegiate. Since many other annual events are clustered around this occasion, it’s a time when colleagues can commune in Bloemfontein, free from the distractions of bright lights or demanding clients. This book is the record of the 27th such event, which saw the first locally grown and practising Sophia Gray laureate give the lecture. Not only is Anton Roodt from the host city but, through his father, Professor Leon Roodt (1924−1995) − whose practice he has inherited and grown, to whom, with Roodt fils son, Leon-Pierre, the compendium is dedicated – he is connected to the academic traditions of its architecture and history. It is thus fitting that he should take on documenting the occasion – and he has done so with authority, finesse and panache. and: provides a synoptic background to the Sophia Gray Memorial Lecture series (vi); lists the laureates (vii); is introduced by Professor Walter Peters (xiv-xv); and has Dr Hendrik Auret, of the UFS Department of Architecture, introduce the City of Bloemfontein through a chronology of maps, images and texts, before presenting the text and images of the projects offered in his lecture. The book concludes with images from the associated mini-congress, then the gala meal following the presentation of the lecture, and thumbnails of the posters on exhibition. It is thus a thoroughly rounded record of the context of the presentation and event. What Karel Schoeman has done for the historical Free State and Bloemfontein as its biographer, Auret captures for the architectural imagination. Roodt literally builds on the legacy of his father’s PhD, documenting the built legacy of the historical past of the Free State as palette for his oeuvre. But one always wants more. It is perhaps not the responsibility of the laureate, but rather the Department, to provide the full record. A feature of the lecture is the range of venues selected for the presentation. It would be useful to have a record of these with a short statement of their significance. The Department’s Jan Ras usually orchestrates other events, which are memorable in their own right. Places visited, congresses, mini-congresses and suchlike add to the richness of the occasion. We take these for granted but minds fade and institutional memory dissipates, so perhaps it’s time for the full record. Architects invariably become creators of documents, initiated into this art at the inception of their studies. With media technology, book-making is brought to the level of fine art − as evidenced by the design thesis documents from schools of architecture. This book is a model of the art, with the graphics well located and balanced on the pages, and – my bugbear − little by way of clashing of graphics in the spine binding. The extensive sponsor list bears witness to the costs of a print production, here done on high-quality paper. The title promises big dreams. 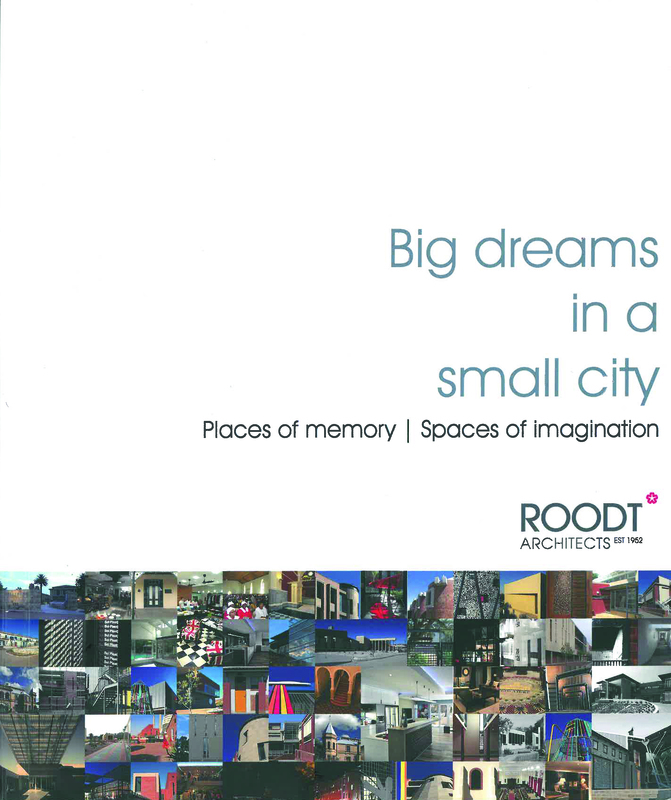 In his text, Roodt says architects deal in dreams. As oneiropolists (he prefers oneiroscopists), they are interpreters of dreams. He ends by referring to his own home, a space (rather than place) where one is permitted to dream. The dreams presented here are big – not in the sense of largeness or extravagance, but through accretion of place, space and time.